Do you want to make a change without cutting your hair? Here are the trends for our Curvy Women! The novelties, the coloUrs and the most innovative tones of this 2018 are numerous, from bright tones to more natural ones, from hair layered just to the right point to make the ends curl at the tips, to beach-wavy hair, passing through those classic curly and straight hairstyles. The important thing is to choose the coloUr of your hair by evaluating your complexion and the cut that is most suitable to the shape of your face. Warm, shiny tones. Tones that spread out all through your head of hair like watercolours on canvas. It is important to keep up-to-date on the latest trends, and then be able to 'invent' novelties and experiment with new looks according to your personal taste. This Spring–Summer, hair will have a look that is inspired by the styles of the previous seasons: wavy hairstyles, beach waves, with a predominance of braids and chignons, but also creative hairstyles. Ultra-defined eyebrows, ultra-matte lipsticks, but also double-volume eyelashes. High ponytails and soft chignons are back, or hair tied back with a wet effect. Do you have straight, thin hair and a face with regular features? The 'Bowl cut' is the most suitable form in this case: an uneven and irregular bob, fuller at the top with a tuft or geometric-shapedfringe. Do you have medium-to-long hair and a more curvy face? In this case, the 'flat waves' might be the best solution for you. 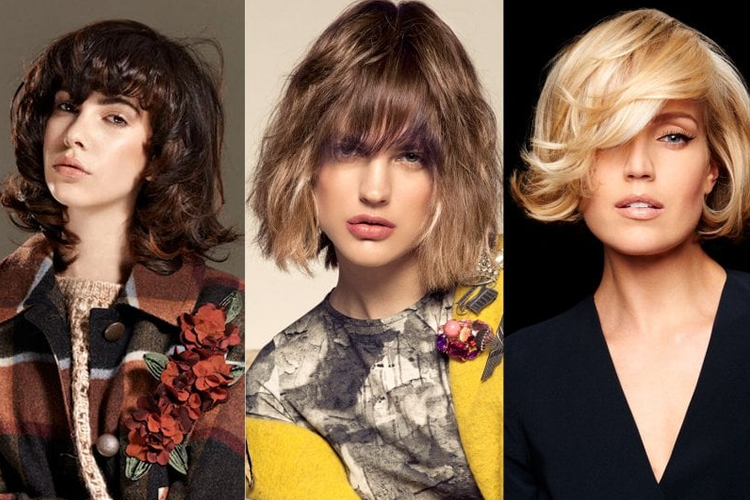 Flat, natural waves that give a vintage look to your face, for a determined, sophisticated and glamorous look, to minimize with an outfit that is more easy-chic and informal. For all shapes of the face, the 'Ob-swag', is undoubtedly the winner. This is a medium-long cut for curvy womenwho have "summer inside", to quote the title of a song by Jovanotti. This style is characterized by a deliberately unkempt, happy-go-lucky and wild hairdo. As for the colours, however, they must be personalized by playing with light-dark tones and studying the woman’s features, complexion and eye colour. Exactly like in the world of make-up, even for hair there is hair-contouring that thins down the chin and cheeks, raises the neck and shoulders. By following these tips and choosing the Lizalù Spring - Summer collection, the result will be that the identity of each one of you will come out and you will feel unique and dazzling. Absolutely forbidden to go unnoticed!